X-Marker L-893(L) Runway Closure Marker - Wanco Inc. The Wanco X-Marker is an L-893(L) lighted visual aid to indicate temporary runway closure. It efficiently and effectively warns pilots of closed airport runways and taxiways, and protects maintenance crews working in these areas. Proven technology, the X-Marker is in extensive use at airports today. The Wanco X-Marker Runway Closure Marker is a lighted visual aid for indicating to airplane pilots that an airport runway is closed. 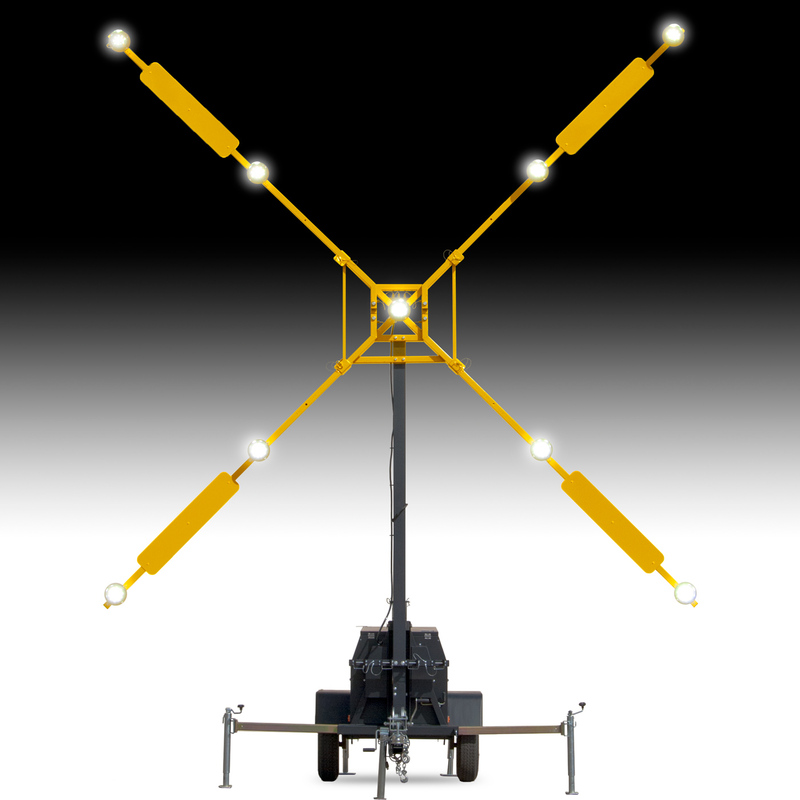 Designed to exceed FAA requirements, its flashing lights can be seen both day and night from miles away, clearly discernible as a giant “X” and distinguishable from other lighted visual devices used at airports, signifying that the runway is not open for landings. The X‑Marker trailer is easy to transport and can be deployed by one person in less than five minutes. The “X” shape comprises nine lights on four independent arms and a mast. When deployed, the mast tilts upward nearly to vertical, and the “X” is centered at the top of the mast. 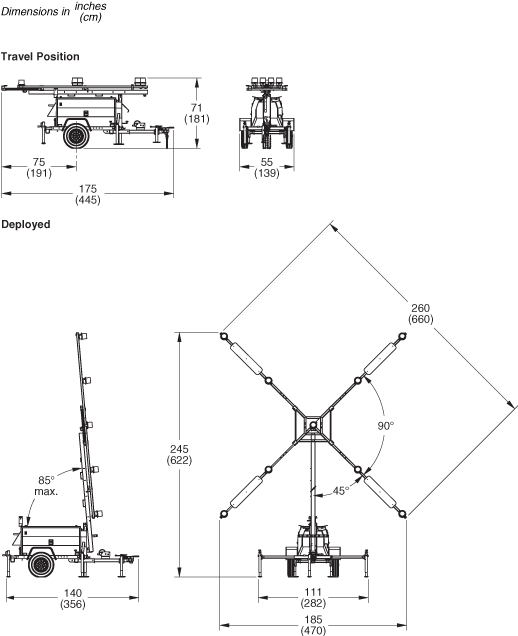 For transport and storage, the mast tilts downward and the arms pivot together. The entire assembly lies flat when stowed, held in place by support brackets and lock-pins. Each arm includes two high-efficiency LED light fixtures, with one additional light fixture located at the center of the “X.” LEDs provide highly directional light distribution, resulting in high luminosity and low power consumption. System power is provided by batteries that are charged continuously by a diesel engine. The system can run continuously for up to a week without intervention or refueling, and the batteries continue to power the lights if the engine shuts down. The power system is housed in a weather-resistant enclosure that has two side doors for easy access. For complete access to the engine, generator and electrical components, the enclosure also has a hinged top panel that rises with the “X” assembly when maintenance is required. The side doors may be opened while the maintenance panel is raised, further enhancing access. An optional secondary-containment system, integrated into the enclosure, protects against fluid leaks, spills and drips.